This tutorial is the second part of the Platforms tutorial. Here we will create Blueprints for our moving platforms. Having the platforms as Blueprints will allow us to give these platforms instructions of how to behave. To do this we will have to give our first steps in the Event Graph and the Construction Script and start to create some Variables. We are going to start by duplicating the texture that we already have for our platforms. I like to do it this way this so I can do as many modifications to the platform as I want without affecting the fixed platforms, as having a different material applied, or diferent sizes. Name your blueprint. I will name mine as MovingPlatform_BP. Now if you double-click in your blueprint You will open all the information about the Blueprint and the Construction Script, the Event Graph, and the Viewport of the Blueprint. At this moment is not much going on, everything is pretty empty and the blueprint does not even have an image. In the left top corner of our screen we see the Add Component tab in green colour. 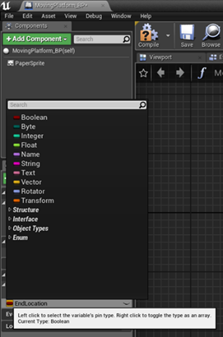 Unfold this tab and type Sprite and select PaperSprite. 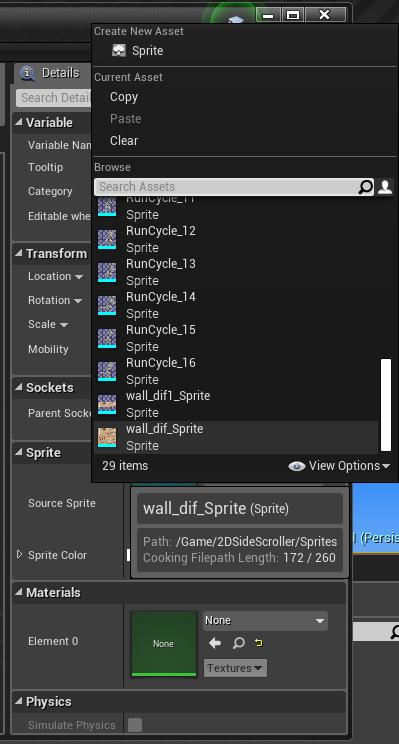 Now, with the Paper sprite selected we move to the right side of our screen to the Details Panel and in the Sprite section we search for the sprite we created in the beginning of this tutorial and select it. Above your viewport Compile and Save. You can minimize your blueprint window for now. You can drag now the blueprint in your scene and will behave like a normal sprite. In order to have the platform moving in our game we have to do some programming in the Construction Script and the Event Graph. To understand the difference between them think of a car. The fact that the car has an engine and wheels does not imply that the car is moving in the road, you need to start the engine with a key in order to make the car move. Well, in the Construction Script we build the car, and the Event Graph is the key that starts the engine. Check Unreal documentation here to have a better understanding of what the variables are. We are going to create the following variables for our lift. Open your platform Blueprint again. In the left side of the screen in the lowest section we have the option of adding new components for our graph. Click the symbol + beside the variables and this will create a new variable. We will call this variable TestEndLocation. By Default This variable should be already a Boolean, if not, click the little symbol that is to the left of the name of your variable to unfold the menu a change this variable, to Boolean. Activating the little eye to the right of the variable we are going to make this variable public, this means we are going to have access to it from our main Details Panel when we are building the game. Create a new variable and call it EndLocation but this one is going to be a Vector, and to change this again, click in the little tab to the left of the name and unfold the menu, and from there chose thee yellow option Vector. Create another 2 more variables of green colour (Float) for your StopDelay and for TravelTimeSeconds. Finally create one to change the colour of our platform if we want and call it LiftColor. This last one is going to be a linear colour class of variable which is not available straight away in the menu, to find it type in the search bar colour and choose the category. Make sure all 5 variables are public clicking in the little eye so we can access them later. Click in the EndLocation variable to open its Details Panel in the right side of the screen and activate Show 3D widget and set the default value Z to 100 to be able to see in the viewport the difference between initial location and Endlocation. To the TravelTimeSeconds Variable also give a value greater than 0. Make sure you are in the Construction Script tab. On an empty space of your construction Script right click to open the menu and type Set Relative Location. From the options chose the one for the sprite. Connect this to the Construction Script node that is already on the screen. Drag to your graph the variables End Location, TestEnd Location, and LiftColour. When you drag the on the graph you are given 2 options, Set or Get. Chose Get. Another way to Get the variable is dragging + Ctrol. Now connect the Return Value of the Select Vector to the New Location node in the SetRelativeLocation. Your graph should look like this. To set the colour pull from the location exec node (the triangular that is not connected yet) and type SetSpriteColour. Connect the LiftColour variable to the New Colour Node. 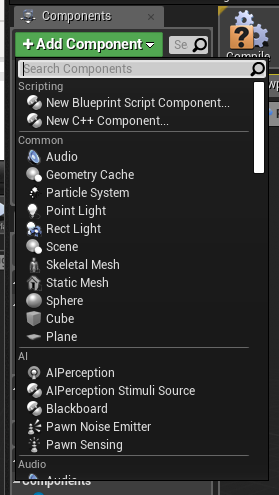 In the Details Panel to your right, make sure the A value (alpha: Transparency) is set to 1. Your Construction Script should look like this. Beside Tab of the construction script, you can see the tab for the Event Graph. First thing we are going to do is to call a time line for our platform. Right click in an empty space of the Event Graph viewport and type Timeline and in the bottom, you can see the option Add Time line. We can name this LiftTimeLine. We click the icon with the F+ and a timeline will show up. We can call this Driver. You can zoom in and out of the track with the wheel of your mouse. Right click in the point (0,0) of the time line and add a key to CurveFloat. Find the point (1,0) and add another key. Finally, in the options above the timeline click “Use last Keyframe? “and “Autoplay”. We go back to the Event graph. We want 2 events to take place in our timeline. We want our lift to move forward and once there to move backwards. For this we are going to add 2 Custom Events and call then LiftForward and LiftBackward. To create these events just right click in a blank space of your graph viewport and type Custom Event and select Add Custom Event. Hook the first to the Play From Start node and the second to the Reverse from End as shown in the next image. We want our lift to reverse when it reaches the EndLocation. From the Finished node in the timeline we can pull a Switch Timeline Direction and from there we are going to invert the Events from the Forward node we pull LiftBackwards and from the Backwards node we pull LiftForward. Connect the Selection node in the Switch to the Direction node in the Timeline. To allow our character to have time enough to jump in the platform we have to indicate to the lift to have a Delay before it goes back to the initial position. We are going to put a Delay between the Update node of the Time Line and the Switch TimeLine direction node and in the Duration of the Delay we are going to connect our variable StopDelay to have option to change this when editing our game in the viewport using the details panel. In the Details Panel of the StopDelay Variable in the bottom we can change the default Value for the Delay to 2 seconds, but we will be able to modify this for every individual blueprint that we drag into our viewport later in the Details Panel. Compile and Save. You can test now the platform and if you have followed all the steps it should be working, but there is still one problem to solve. When you test your character gets trapped under the platform if they collide. We want the platform to change its direction also when it touches the character. For this we are going to create a collision box for our sprite. Add a new component Searching in the search bar for Box Collision, you can name it Collider. Event "On component begin overlap"
From the event we pull the 2DSideScrollerCharacter, because this event is referring to him. And connect the object node to the OtherActor node of the event. Now we want to stablish some condition for the left to change the direction of the time line. From the 2Dside scroller pull and type Branch. First condition is that our the timeline of our lift is active. Drag from the Blueprint Panel the LiftTimeLine to the graph. We can test now and the lift should be working perfectly. The last bit of code that we are going to do in the graph will allow us to change the time that the lift takes to move along the distance that we specify. We can use the Event Begin Play. Right click and type if is not already in your Event Graph. Drag a reference to your timeline to the graph and from this reference pull the Play Rate command. Link to the Event. Finally from the play Rate We pull the Set End Location and click the condition Box. With this last piece of coding we will be able to change the speed of travel of our platform in the Main construction screen and Details Panel. Just duplicate the blueprint and add a new sprite to have different types of platforms. This example of moving platform can be used also to build as many obstacles as your imagination can design sometimes by just adding the ability to cause damage to our character. Do you like to know how to improve further this Platforms and even make your enemies out of them? Jump to the next tutorial of these Series and learn how to do it.